Namebench is an open-source DNS benchmark utility listed at Google Code Archive. You can install it on any Ubuntu-like Linux with sudo apt-get install namebench. The config files are at /etc/namebench/ while certain lists that are used by the program are here: /usr/share/namebench/data/. It ships with a GUI but I prefer the usage through the CLI. Be careful: Without any options it immediately starts testing some (many!) servers. For information about its options you must use the -h switch: namebench -h.
Namebench has a couple of input sources while the most interesting ones are “alexa“, “cachehit” and “cachemiss“. While the first one queries different FQDNs out of a built-in Alexa list the other two options test exactly what the names imply: either cache hits (by only querying the same name again and again) or cache misses by querying random names for which the DNS resolver must first look up the record itself before delivering it to the client. Note that the “cache-hit.txt” file which is used for the cachehit procedure queries the A record of “a.root-servers.net.”. In my test cases (below) this made a difference compared to some other DNS queries. I am not quite sure why but I suppose that this is related to some built-in lists for the root servers into the DNS resolvers. For example, Unbound has a “root.hints” file which holds the A and AAAA records for them. Hence, this file is queried rather than the cache itself. In my examples I changed the content of the file which changed the test results dramatically as well! Furthermore note that namebench does some kind of sanity checks which are completely outdated. I commented out any sanity lines within the sudo nano hostname_reference.cfg file to get rid of the warnings in the results. These are not correct anymore since the offered service such as Twitter or PayPal use other A records nowadays. The results are stored at /tmp/ such as /tmp/namebench_2017-10-27_1204.html. Dnseval is one out of three tools from the DNSDiag suite by Babak Farrokhi. At GitHub there are some install instructions. I already published a few information about dnseval here: Compare & Troubleshoot DNS Servers: dnseval. However, I merely looked at troubleshooting issues with DNS flags, TTL, and caching issues. Today I want to use dnseval to benchmark the DNS resolvers which is almost the same though. ;) I am simply using much more queries (such as -c 2000) while I started the measurement after I initially queried the name from all servers in order to have it in their caches. Be aware that dnseval only tests cache hits since it queries the same name again and again. For every run I queried 2000 entries. The winner was OpenDNS with a mean response of 75 ms (green) followed by the local Fritzbox with 87 ms (purple). 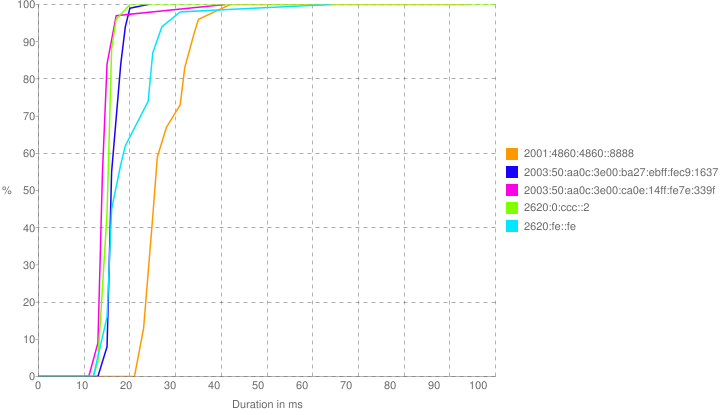 Unbound (151 ms, blue) and Google Public DNS (178 ms, orange) are the last ones. I expected that Google would be faster. Hm. On the graph you can see that Unbound (the only iterative working DNS resolver in the test case) has a slow-growing curve since it really must query each name independently since I don’t have many cache hits in my local network compared to all public resolvers. Ah, here we go. Now the Fritzbox (first line, 2.17 ms) is only a little bit faster than Unbound (second line, 2.43 ms). As already noted I suppose that this test case now was a real cache-hit while the built-in version from namebench did query some local root.hints files. 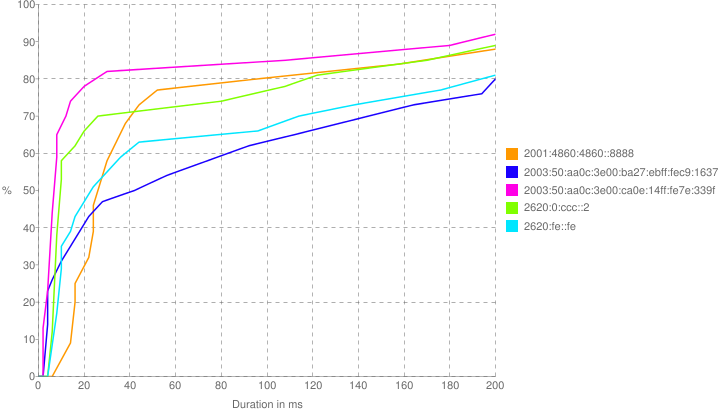 In any case, the three public DNS resolvers are almost comparable while (of course) slower due to the network patch. The winner again was the local Fritzbox router (purple, 14.63 ms) followed by OpenDNS (green, 15.52 ms), Unbound (blue, 16.79), and Quad9 (turquoise, 19.99 ms). Google Public DNS again was the slowest one (orange, 28.20 ms). As you can see in the graph, almost all curves are the same since all DNS server must query the random value one by one. The orange line from Google is shifted to the right, probably due to a slower routing path. Compared to the updated cache-hit test from namebench the order of the DNS resolvers is almost the same: Fritzbox won, followed by Unbound which are both faster than the three public resolvers. Looking at them, OpenDNS was the fastest, but this time followed by Google Public DNS while Quad9 was the slowest. It’s not easy to interpret the measured values in the correct way. You must precisely know what you are testing. As already pointed out you can test cache-hits, cache-misses or “real world” queries such as Alexa Top 1M which will have many cache-hits on public resolvers while just a few on your own resolvers. In any case you are NOT benchmarking the load of a DNS resolver such as “how many DNS queries can it handle in parallel” or “how many clients can be handled by a Raspberry Pi” but the latency for single DNS queries. That is: you’re testing the IP routing network latency + the mere DNS server latency together. Featured image “Koblenz – Hochwassermarken am Kranhaus” by onnola is licensed under CC BY-SA 2.0. Can you post traceroutes and chaos query results for each of the anycast nameservers, so we can see where the performance difference was coming from? Hey Bill. Thanks for your question. I added the results for the traceroutes and chaos queries in the blogpost above.